Bepannaah is a path-breaking show about infidelity. The leads, Aditya and Zoya truly believe in loyalty in their relationships. Zoya is happily married to Yash. She is a sweet and innocent housewife, who has immense faith in her husband. On the other hand, Aditya is a loving guy who believes his wife Pooja a lot. He stays happy in his marriage. He is unaware that Pooja is cheating him by having an extra-marital affair. Aditya and Zoya lose their spouses Pooja and Yash in an accident. Bepannaah is a story about finding true love, losing the ones you love and also understanding the true meaning of love. Destiny brings Aditya and Zoya face to face only to explore their life partner’s love affair. Zoya doesn’t show any disbelief in her husband, while Aditya vents out his anger and hatred towards his dead wife after learning her cheat. The plot is about an impossible love story of Aditya and Zoya, which starts with hatred, then switches to friendship and transforms into love. The mystery of Yash and Pooja’s death will bring in many twists. They have a lovely bond of friendship. They had been childhood friends and then turned into life partners. They had studied together and had lots of fun during their college times. Aditya finds Pooja a perfect girl for him. They had realized their love and eventually got married. They respect each other. Pooja understands him very well. She knows his strengths and weaknesses. Aditya feels he can’t live his life without her. He needs Pooja badly in his life. Pooja is his main support. Aditya is very sensitive. Pooja has always handled him emotionally. He is a professional pilot. Aditya has rough terms with his dad. He is very much logical and calculative. He wants the wrong doer to accept mistake and not argue to justify. He is very expressive about his feelings. He can’t control his ire when he learns Pooja has cheated him by breaking his trust and loyalty. He gets too hurt and ends up hurting others to make them feel his pain. Yash is a decent and hard working guy, who loves his wife Zoya a lot. He wants to keep his family happy. He hides all sorts of problems from his family. He runs his business. He is very caring and responsible. He deals with all obstacles all alone. He believes in unconditional love. Zoya hails from Mussoorie. She is a Muslim girl. Her life was always perfect. She married the guy she loved. She had a protective childhood too. There was nothing she could complain about. She was always pampered by Yash and her family. She lives happily in her perfect world, full of love, respect and happiness. One incident shatters her world. She loses Yash in an accident. She then learns about his affair, but tends to not believe it. She doesn’t let any suspicion enter her heart to spoil Yash and her memories. She then overcomes the tragedy with the support of Aditya. She regains strength and finds her perfect love in Aditya. She then self-discovers herself. Aditya and Zoya are seen deeply in love with their spouses Pooja and Yash. Zoya celebrates her love and relation of five years with Yash. She is completely smitten by his charm. Zoya has blind faith in him. She showers much love on him, but he seems to be lost thinking of someone else. Her love doesn’t keep him engaged. Zoya prepares to celebrate their wedding anniversary. She is ready to do anything for Yash. Aditya and Pooja are introduced. Aditya is a professional pilot. He is married to his childhood friend Pooja. He feels too lucky to find love in his best friend. Aditya believes Pooja is very true and loyal towards him. She seems much devoted towards her husband. She has been hiding a big secret from Aditya. Aditya is forgetful sometimes. He forgets Pooja’s birthday. She reminds him her birthday. He promises to celebrate her birthday. She knows his playful side and habits well. She hides her secret diary from Aditya. She doesn’t let Aditya read her diary. Zoya finds a ring in Yash’s cupboard. The ring doesn’t fit her. She doesn’t think much about it. Aditya and Zoya meet at a shop in Mussoorie to buy gifts for their spouses. They like the same Gramophone to gift Yash and Pooja. They have a cute argument to buy the Gramophone. Aditya manages to flee with it. Zoya gets chasing him to get the Gramophone back. They both receive a shocking call. They get informed about the most terrible thing. They rush to the accident spot and witness Yash and Pooja lying dead, holding each other’s hands. Aditya and Zoya’s world crashes down. Aditya feels shattered and feels Pooja has cheated him. He concludes Pooja was with her lover at the time of death. He reacts too angrily. Zoya refuses to believe what meets her eyes. Police hands over Yash and Pooja’s dead bodies to their families for last rites. The show describes various stages of love and marital relationships, how people perceive their partner’s deceive and fall in dilemma to pick up a second chance in life. It emphasizes on the tough phase when one has to go through a big heartbreak after a spouse’s cheat and loss. Both Aditya and Zoya are poles apart when it comes to handle their spouses’ affair truth. Aditya instantly believes Pooja’s affair and develops strong hatred for her. Zoya doesn’t change her opinion about Yash, even when the world speaks against him. Aditya and Zoya have one thing in common, that’s their belief in loyalty in their relationships. The other characters, Yash and Pooja find love in each other, while they were pretending to be happy in their perfect marriage. Zoya and Aditya will be ultimately finding love in each other after going through a lot of emotional turmoil. The show will highlight on Yash and Pooja’s back story about their affair and emotional connect. Zoya and Aditya will be questioning themselves to know where they failed in not being perfect for their spouses. Zoya and Aditya’s journey of self-realization will be seen. They will find love again. They will get married by going against their families and society. Their strong bond will stand out despite facing many hurdles. The characterizations are strong, contrast, distinct and right on their front. Aditya and Zoya’s stories are interwoven well. Their immense love for their spouses is depicted well. Everything from dialogues, sets, costumes, screenplay to the stellar cast is perfect for the show. Jennifer plays the role of Zoya perfectly. She makes the character more watchable by her striking looks. Harshad is very much natural as passionate lover Aditya. The leads outshine in their portrayals. Even the other leads Sehban and Namita do complete justice with their roles. The show has a fresh appeal, even though there had been many shows around infidelity before. Bepannaah looks much more promising because of its contrast characters. Bepannaah is an intense love story with much emotions, drama, romance, mystery and thrill. The story begins after post marriage phase. The relationships are seen with much detailing and emotional depth. A show with a unique and heart-touching storyline. Yes , the way you described this was nice but I thought that maybe Yash and Pooja were not having affair because if they hold hands together doesn’t mean they were having affair but the other things make me believe they were like the ring not fitting Zoya. How can Aditya doesn’t trust Pooja just by seeing her holding hand of Yash. Also I want Zoya to revolt back at yash’s mother and sister mainly his sister .Zoya should not be too polite like Aditya said,she must teach her a lesson . Eagerly waiting for the mystery to get unfold. Worth watching show apart from saas bahu dramas. I don’t think Yash and Pooja were lovers, i suspect they were working together perhaps undercover or spies or maybe they were being blackmailed into do covert spying….or at least i hope it’s something like that. You gave the correct score to it…Its really an awesome romantic show…?? It deserves this much of rating because it is that much superb! 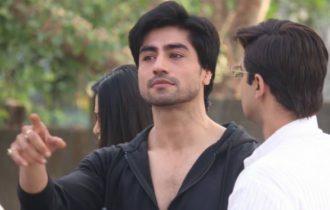 Bepannah rocks! I love it totally! And the way u described it, it makes it more interesting.. Jennifer is awesome in this… O mysterious… Waiting to know further.. This series indeed is different, yes infidelity has been used earlier in stories but the twist of the death of the cheating spouses is different. As they try to find out the reasons behind them cheating, Adi and Zoya would come closer. But I think there are some underlying reasons behind Yash and Pooja’s case, anyway its going to be interesting. Just one thing I hope is that this series won’t turn out to be the same ol’ saas bahu dirt. The problem with Indian TV is that once they start a unique show, they love to destroy its uniqueness. Bepanaah, I hope, would not be a victim of that. Excellent !! Can’t agree with your affair’s point !! Nice review…. Yeah this one is worth watching.. …….Nice story……strong characters…….got something interesting to watch….hope it runs on the same pace with its all worthy characters!!!!!!!! The show is amazing and beautiful..
After a long time getting something marvellous on small screen… wonderful starcast and lovely story concept! Hope this lovely show will not lose his beauty like other Indian shows…..
Guys anyone tell me last week trp of bepannah?. Hiiii I am big fan of Jenny. At first I watch for Jenny later I comes to watch for both harshad and Jenny aka Aditya and zoya ???????????????? ?